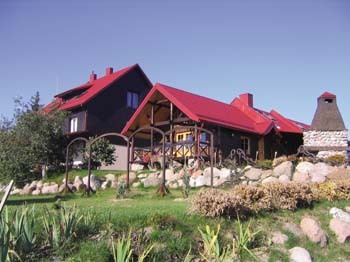 On the sunny side of the great river Nemunas (The Memel), right down to its sandy beach, we opened our new guest house in July 2003. An old citizens villa has been totally renovated and converted to a 7 rooms guest house, every room with its own toilet and shower, new furniture, TV antenna, and of course, good service. From most rooms you can enjoy the splendid view of the river, its now clean water, and the long bridge spanning it half a mile away. There are 3 single and 7 double rooms and one room for 3 persons. Seven rooms have own shower and toilet, the others share common shower and lavatory. The camping is situated near the river, there is a camp fire place, playing ground, toilet and shower. A splendid base for excursions along the river with its old castles and churches, into the large woods or to the cultural institutions of Jurbarkas itself. Bicycles and fishing tackle are for hire, and so are boats from a close neighbour. From Jurbarkas you can drive to any place in Lithuania and - after hours of sight seeing - back the same day. From the river beach and from the many lakes of the region, now with clean water, you can on hot days enjoy a cooling swim, and the year around the great woods have plenty of game.